"Empire" actor Jussie Smollett leaves Cook Couty Jail to a black SUV amid a crush of reporters and cameramen. "Empire" star Jussie Smollett is being removed from the final two episodes of the season, producers announced Friday, one day after Smollett turned himself in to police over accusations he staged a hate crime attack on himself to boost his career. Smollett has maintained his innocence, but "Empire" executive producers said they decided to remove his character from the remaining episodes "to avoid further disruption on set." Smollett's legal team said the actor "feels betrayed by a system that apparently wants to skip due process and proceed directly to sentencing." 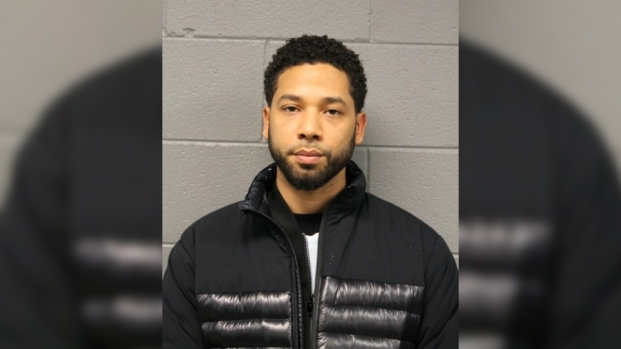 Actor Jussie Smollett was arrested and charged with filing a false police report in Chicago after he said he was the victim of a hate crime. "Today we witnessed an organized law enforcement spectacle that has no place in the American legal system," a statement read Thursday. "The presumption of innocence, a bedrock in the search for justice, was trampled upon at the expense of Mr. Smollett and notably, on the eve of a Mayoral election. Mr. Smollett is a young man of impeccable character and integrity who fiercely and solemnly maintains his innocence." Smollett appeared in court Thursday afternoon, where his bail was set at $100,000 with pretrial monitoring. The visibly frustrated Smollett sighed and rolled his eyes during the bond hearing, according to reports from the courtroom. He was later seen leaving Cook County Jail surrounded by security who led him to a black SUV. The vehicle drove Smollett to Cinespace Studios in Chicago, where "Empire" is filmed. The massive West Side warehouse is home to several TV shows. Numerous cast and crew members from the building said they had "no comment" on the situation. 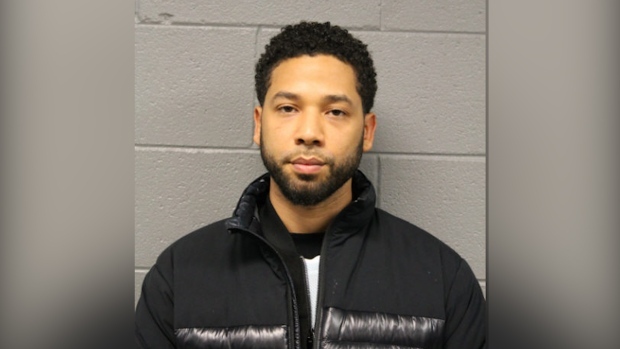 Smollett, who is black and gay, turned himself in Thursday to face accusations that he filed a false police report last month when he told authorities he was attacked in downtown Chicago by two men who hurled racist and anti-gay slurs and looped a rope around his neck, police said. Before the attack, police also say Smollett sent a letter that threatened him to the studio in Chicago where "Empire" is shot, Superintendent Eddie Johnson said. The actor "took advantage of the pain and anger of racism to promote his career," Johnson told reporters at a news conference. "This publicity stunt was a scar that Chicago didn't earn and certainly didn't deserve," he added. The FBI has been investigating the letter. Johnson would not say whether Smollett could face additional charges for that. The companies that make "Empire," Fox Entertainment and 20th Century Fox Television, issued a statement Thursday saying that they were "evaluating the situation" and "considering our options."